There’s an old chestnut about never discussing politics, religion or money at the dinner table. To that list I would respectfully add cilantro, an herb more divisive than the finale of How I Met Your Mother. I don’t pretend to be an unbiased journalist on this matter. My personal feeling about cilantro is that it’s the Donald Trump of herbs: too loud, always showing up in places you don’t want it, leaves a bad taste in your mouth. The flavour experience can best be described as an unholy marriage between Thrills gum and an old penny – both plucked from the mouth of a rotting corpse. So before you continue reading today’s Decoder, please remember that it’s not nonpartisan; I’m coming at cilantro with the extreme prejudice of someone who has just bitten into an oatmeal-raisin cookie thinking that it was chocolate-chip. The struggle is real. It’s everywhere: Cilantro is by far the most overused herb in restaurants. It works harder than Sofia Vergara’s brassiere. I can’t tell you how many times I’ve taken a bite of food that has no business containing this plant but is nonetheless rife with it. Do chefs just stuff cilantro into t-shirt guns and shoot up the plating area? Even if you appreciate the taste, that level of ubiquity gets old pretty fast. Genetics: Admittedly, this is the ‘It’s not you, it’s me’ defence but it’s still totally valid. A number of studies suggest that there’s a genetic component to cilantrophobia, with certain people being predisposed to detecting a soapy taste within the herb. In other words, much like exorcists, some of us are just better at recognizing evil. Ill effects: When cilantro-lovers hear that I hate their beloved plant, one of the first things they’ll try to do is sneak it into food to prove me wrong. Because cilantro-lovers are monsters. * Unfortunately, for many people, the ingestion of these leaves can lead to everything from an irritated mouth to severe stomach pain and even vomiting. While I’m luckily not one of those folks – I save my urge to puke for episodes of Bachelor in Paradise – I’ll happily speak on their behalf. 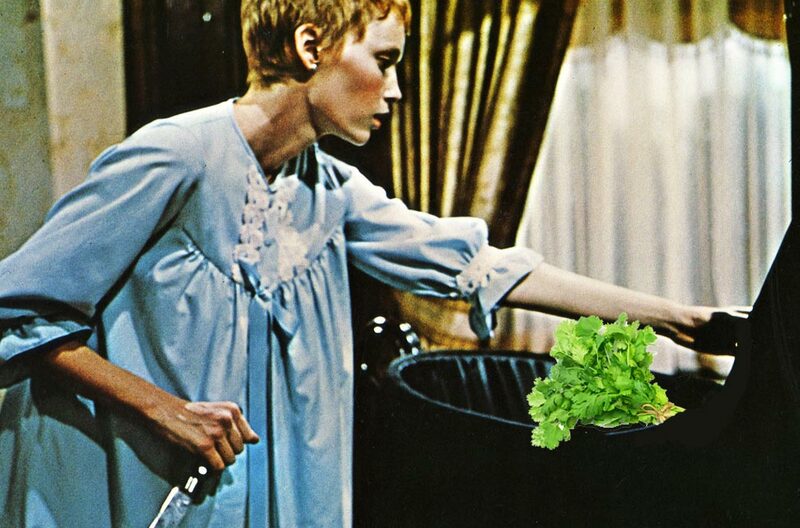 Drama: Nothing tears families apart like cilantro (except maybe zombies). I almost lost a beloved uncle to it! Let’s not let this leafy devil do any more damage to our relationships. By keeping cilantro out of shared food, you prevent a whole mess of mindless debate; there’s enough of that going on with the election. The taste: Julia Child, legend of American cuisine, described cilantro as having a “dead taste.” Barefoot Contessa Ina Garten loathes the stuff, as does Top Chef’s Fabio Viviani, who once quipped that his dream was to “grow 20 acres of cilantro, and drop a bomb on it.” And model Amber Rose, who avoids the herb at all costs, gripes that it reminds her of perfume being sprayed down her throat – and this is a woman who stomached dating Kanye West for TWO YEARS. Case closed. * Ok, cilantro-lovers aren’t actually monsters. That term should be saved for terrorists, and people who say “on fleek.” I apologize. 2 Replies to "Pop Culture Decoder: Why Cilantro is the Devil"
Listen. I read this out loud to Kelly (also a cilantro hater) and we lol’d so hard. It’s like you were here. I loved it! You always make me laugh out loud…. thank you! …. Thrills gum and a penny… man… you funny! xok!